Let's get Tangled! 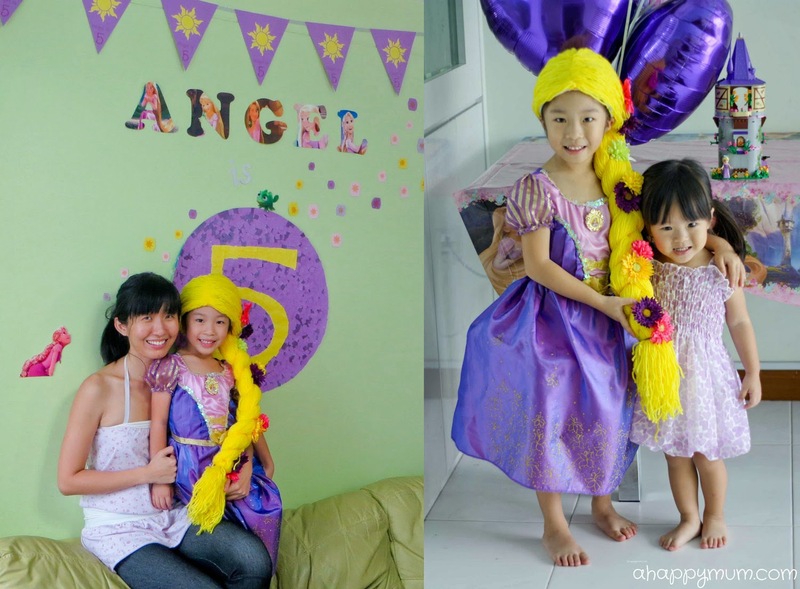 - Angel is 5! 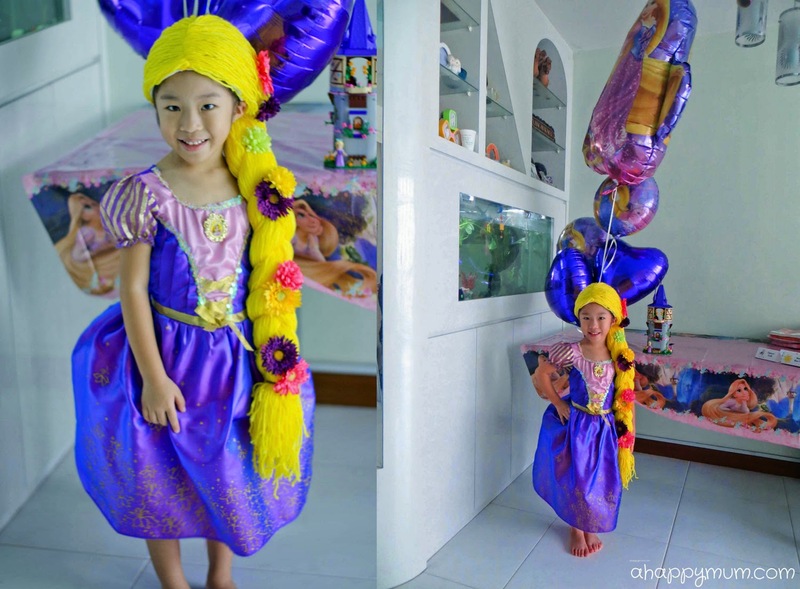 When I asked Angel what theme she wanted for her 5th birthday party, she answered with a smile "Rapunzel" and from that moment on, I knew I had to do my best to make her dream come true. Right, I'm not saying every mum should, or need to, put in such effort and time for a birthday party but in case you don't realise it yet, it is actually a passion of mine and I see it as an opportunity to craft, to let creativity flow, to jazz up the house while making my girl feel just so special on her big day. 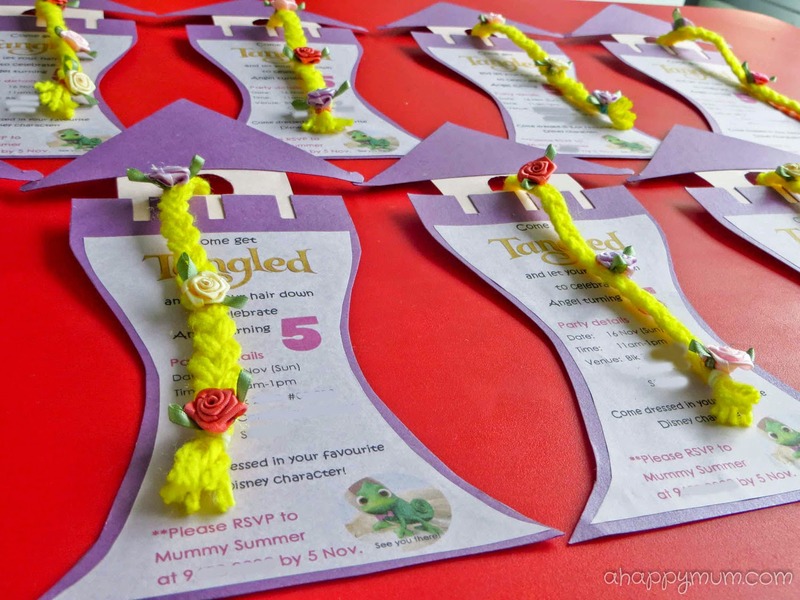 This year, we sent out our DIY Rapunzel Tower invites to seven of her classmates and since some of them brought their siblings along, we had a total of 12 kids as our VIPs on the day of the party. We got her Rapunzel dress from Kiddy Palace and somehow, it was pretty but it just didn't feel complete without the hair. As much as I first doubted if I could succeed, I managed to sew together a Rapunzel wig for her out of yarn after sourcing for much inspiration online. Somebody told me that yellow hair would not fit an Asian face and my girl might just end up looking weird, which wasn't what I perceived because I felt that as long as you felt like the happiest princess that day, you would somehow look beautiful and shine like one. The night before the party, we got back home past ten because we were out for a whole day at a navy family day gathering. Similar to last year, my mind was constantly on the party and I kept asking myself if there was anything I had missed out and silently made a checklist for myself to go through. Wall decor. Done. Posters. Done. Party favours. Packed. Balloons. Pumped. Food. Ordered. Drinks. Bought. Cake. Collected. Craft materials. Done. Table decor. Done. Games. Prepared. Prizes. Packed. To be frank, I actually felt quite well prepared this year and I think being a birthday host is really a case of practice makes perfect. So, the big day was finally here and it was time to rise and shine! We stuck a welcome poster on our gate and some directional posters along the corridor while eagerly waiting for the guests to arrive. One of the fellow mums came with 12 freshly baked chocolate cupcakes which totally delighted the kids. Isn't that just very sweet and nice of her? Thank you, Sara's Mummy! The party was scheduled to start at 11am but as usual, we had people who arrived on time and others who came one hour late. So, I always like to start off with a craft activity and this time, I let the kids do colouring and a 3D Pascal papercraft which would be used for a game activity later on. To save time, I had cut out all the heads and bodies of Pascal previously so all they had to do was to colour and write their names. It could get a little tricky folding and sticking it into a chameleon shape so I did it for them while they were happily munching on their lunch. Our first game for the day was the Pascal Toss where each kid had three tries to toss and land his/her own Pascal onto the LEGO tower. It might look easy but considering Pascal is made of just thick paper, it's actually quite challenging if you stand a distance away! For the second game, we made use of these DIY crepe paper rolls which I had spent some time cutting, sticking and rolling onto toilet paper rolls. Guess what we were going to do? 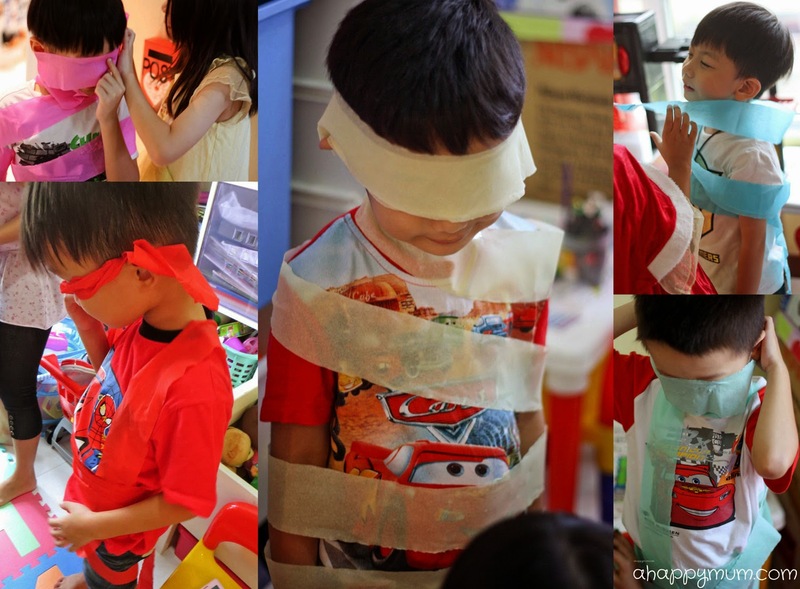 Oh yeah, we divided the kids into pairs and played the Mummy Wrap game where the aim of the game was to get as tangled as possible. Look! I think they all did a great job! I had a fellow dad who was spontaneous to join in the activities and so he was my guest judge in picking the winner. Guess who? Well, it was an unanimous decision that the Yellow team won! Next, it was time for some outdoor fun! For the third game, we had fun smashing, or trying to smash, Flynn Rider. Seriously. 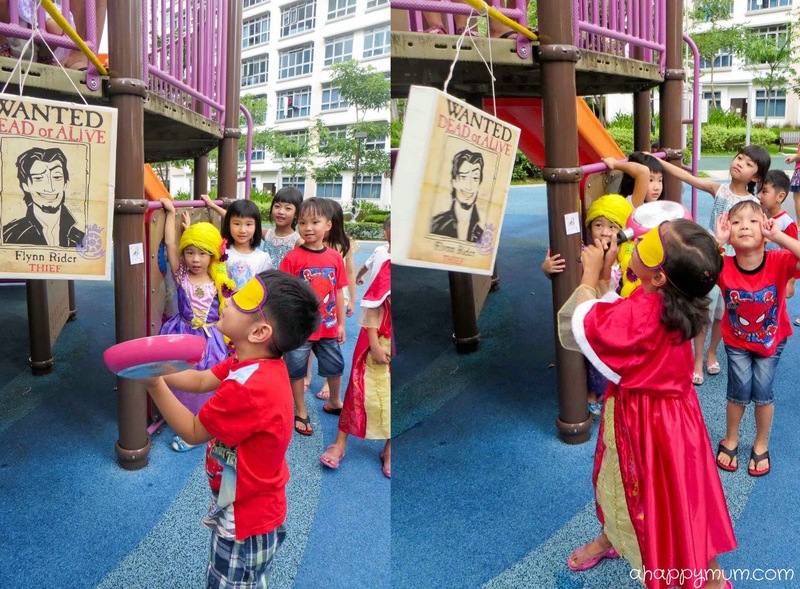 Yes, this was the DIY Box Pinata which was really easy to make using a box and paper mache. Both Angel and Ariel helped in the making and I think we probably made it too sturdy since it lasted longer than I imagined it would. Instead of the usual stick, I had the kids use a pan to smash the Pinata instead since this was such a classic part of the Tangled movie. If you intend to play this in future, be careful that the child doesn't smash the pan into another friend's face yeah! No, that didn't happen in our case, I'm just saying. I'm always touched by the fact that whenever goodies fall out of a pinata, Angel will just take 3-4 items that she really loves and comes up to say "These are enough for me, Mummy" and let her friends split the rest. Yes, to be contented is bliss and it is the key to a happy life, so don't you ever forget that, my dear. For the last game of the day, we had the kids go about a Scavenger Hunt trying to find different character cards to form a set. There were 50 of these cards spread around the playground and fitness areas so there was a little bit of running to do. I had also decided to put two bonus cards (the ones with all the characters) so the kids who managed to find these first would get a special prize. Easy but fun, right? You know what? Five seconds after we packed up and were heading back to the house, a heavy downpour started. Yes, we were that lucky. If we had just ended minutes later, all the cards lying around would have been soaking wet and we would probably have to cancel this last game. The final highlight of the party had to be the awe-inspiring and gorgeous Rapunzel barbie doll cake, baked by a kind and talented friend of ours who picked up baking when we were in Sweden. Isn't it just amazing? All we did was to pass her our Rapunzel doll and she made this beautiful dress which was in fact a chocolate sponge cake. Yum yum! Thank you so much, Lenny! As for the birthday girl, I can't say she is a cake lover but she was on top of the world to have this delightful cake and more importantly, her beloved friends to celebrate this special day with her. 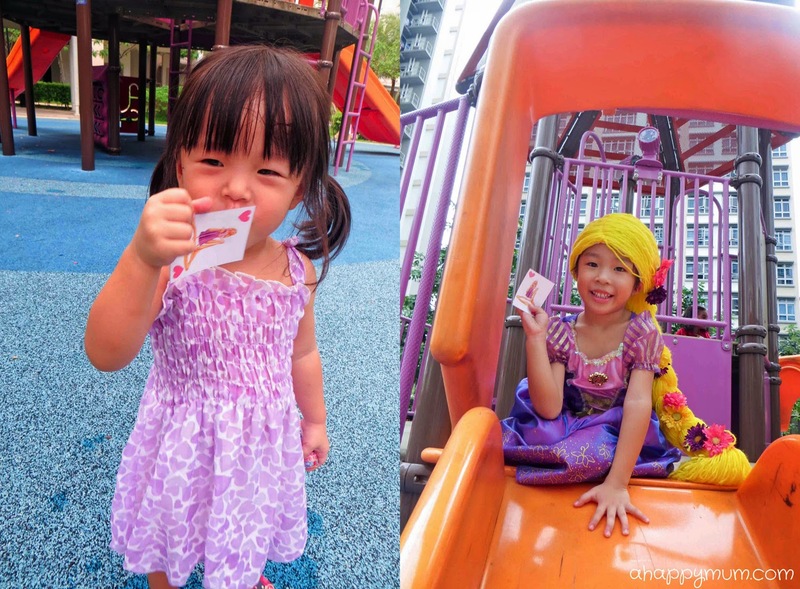 Last but not least, we gave out party favours which were filled with craft supplies because we wanted to encourage the friends to be as artistic and as imaginative as the long-haired princess. If there was a sign that everyone enjoyed the party, many of her friends stayed on to play together till it was near evening time! 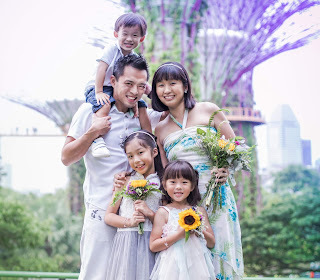 Dearest Angel, happy turning 5 and I just want you to know you are, and will always be, a beautiful princess in my eyes. I hope you had a smashing good time on your birthday and are thankful to have a family and friends who love you so much. This will be another bag of precious memories to last us for a lifetime and makes us smile whenever we reminisce on the good old times, right? Mummy loves you more than words can say, my dear. Happy happy birthday! A big thank you to everyone who attended the party and helped to make it a success in one way or another. We hope you had as much fun as we did! 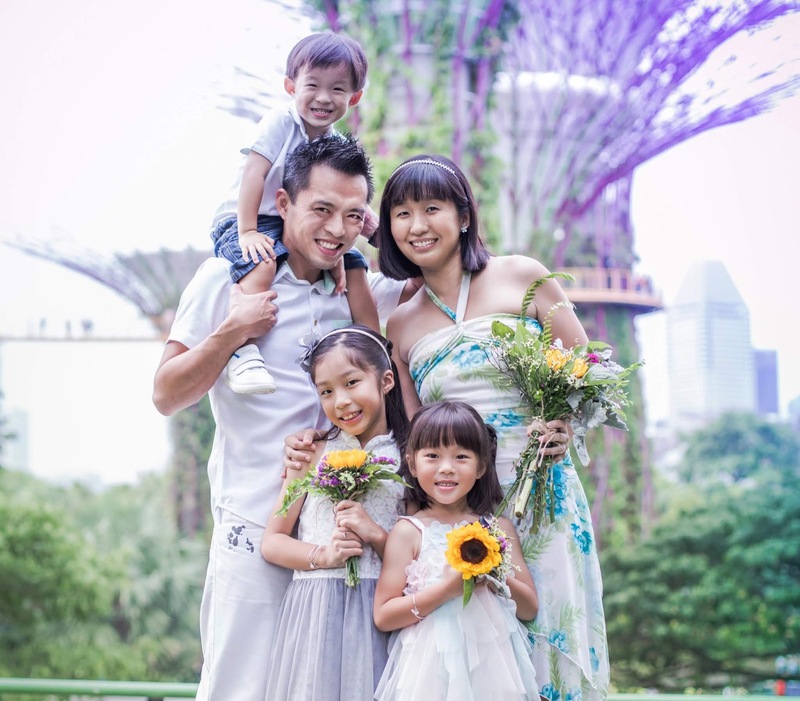 P.S: If you like reading about our birthday parties, check out previous posts on Angel's Rainbow 1st birthday, Disney 2nd birthday, Animal Zoo 3rd birthday and Dora 4th birthday. 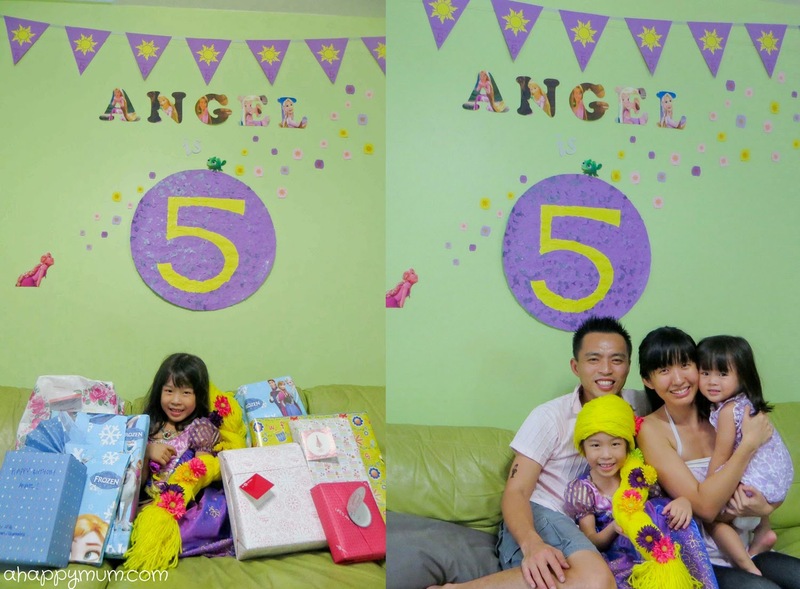 I'm always so wowed by the effort and thought you put into Angel's party. Another inspiring theme party you did there. Thumbs up! This is crazy! I love the decor and especially her hair!!! So pretty! Happy birthday Angel! Beautiful beautiful party! So much fun and so creative too! 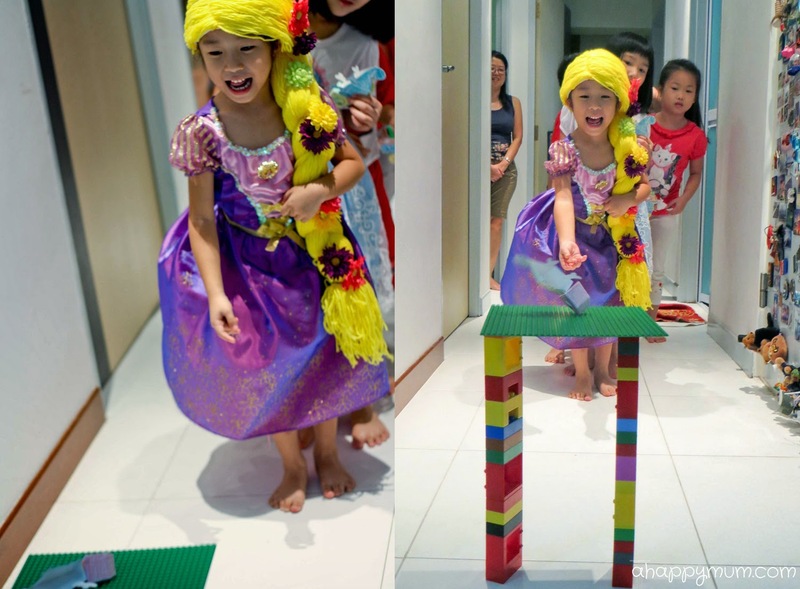 Angelpunzel's hair suits her beautifully! Happy birthday sweet Angel. Kisses!! !